There are few great love stories in the world. When it comes to movies most romantic stories barely register on our radar. It is not an easy thing to create dialogue that doesn't come off stale or melodramatic. Such is not the case of the classic Shakespearean story of Romeo & Juliet. There are few who could say that they do not know the story. What makes the story so classic is not only the epic love story between the two characters but also the profound sense of loss knowing that this couple was wrongly denied their happily ever after. Over the years there have been a few adaptations of this story into film. The last well-known version was an MTV produced movie starring Leonardo DiCaprio and Claire Danes. For those of you who do not know the story it is about two young people who are the children of rival families. One night they happen to meet and instantly fall for each other. The obvious dilemma is that their families would never allow these two people to be together so from the start their fate is sealed. The movie went on to become extremely popular and helped ignite the career of a very young DiCaprio. Recently it was released onto Blu-ray DVD and was given the royal treatment when it comes to bonus features. Amongst the features are a Picture in Picture commentary with not just the director (Baz Luhrman) but also the Director of Photography, Production Designer and the Screenplay writer. Naturally this gives the viewer an extremely in depth view of all the visions that went into making this film. But the features do not end there. We also have uncut footage, a look at the music from the movie and a Live look up sponsored by IMDB (internet movie database). This last option will only be useful to those of you who have an Internet connection for your Blu-ray player. As always with movies that succeeded in the theaters; when transferred onto DVD they were cleaned up exceptionally well so we not only have a superb sharp visual experience but also the sound quality is top notch. For avid fans of this movie as well as the timeless story this is a worthwhile investment. Download Romeo + Juliet from the iTunes Store in Digial HD. 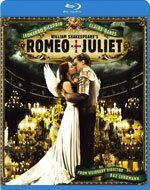 For more information about Romeo + Juliet visit the FlickDirect Movie Database.